Impress Blinds supplies a wide range of quality window blinds in Accrington UK. We have plenty of beautiful designs of Vertical blinds, Roller blinds, Wood blinds, Metal Venetian, Roman blinds, Vision blinds, Velux blinds. From contemporary designs and style to rustic charm, we have all that you want. Whether you want to update your room or office window, window blinds are a great way to add style and value in your home. Having thousands of happy clients in Accrington Lancashire, we have been supplying and fitting window blinds throughout the UK for over 7 years. We proud of our quality made to measure window blinds products, services and cheap window blinds rates. From the conservatory to living room, our made to measure blinds are perfect for homes and offices. Our cheapest conservatory blinds offer versatility and extra insulation. They ensure privacy and reduce the heat without darkening the home. 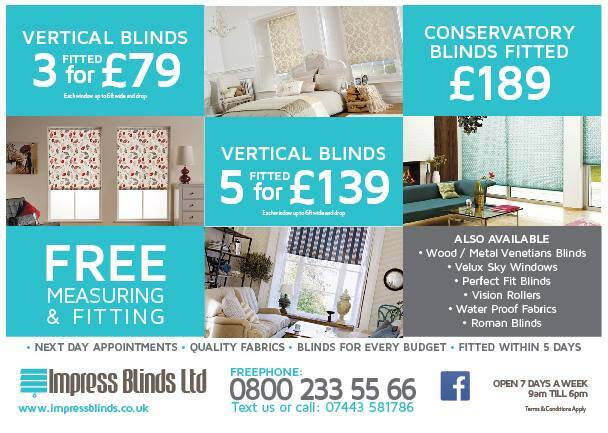 Impress blinds has built a reputation by delivering the best and cheap window blinds and covering solutions in Accrington (UK). With over hundreds of thousands of windows transformed every week, our window blinds team in Accrington (UK) offer the next day delivery of material. We also offer free consultation and fitting services in Accrington for the ease of our clients. So, we assure you that your made to measure blinds will be supplied and fitted in the fastest possible time. Discuss your requirements with us and we will provide you the best covering solution that suits your home style and financial plan as well. Fastest measuring and fitting services in Accrington (UK).